Six people have died and five are seriously injured after a high-speed train hit a car on an unmanned level crossing on Saturday evening. All eight carriages of the 1735 First Great Western service from Paddington to Plymouth were derailed in the accident near Ufton Nervet, Berkshire. 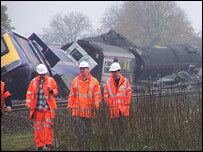 The train, carrying about 300 people, hit the car at around 1815 GMT. An off-duty Thames Valley police officer saw the vehicle drive onto the crossing and the barriers come down. Det Chief Constable Andy Trotter of British Transport Police said the officer alerted the emergency services after seeing "the car remain on the crossing and the train hit the car". He declined to answer questions about whether the vehicle had been positioned on the tracks deliberately, possibly by someone who wanted to commit suicide. But he added it was "quite remarkable so many people managed to escape from such an awful event". Specialist search teams are combing the site to collect evidence, and police are making "extensive inquiries" about the driver of the car. He was killed in the crash and the driver of the train has also been confirmed as among the dead. Mr Trotter said: "This will be a meticulous investigation to make sure we can find out exactly what happened and what caused the deaths of those six people." The Queen has sent a message of sympathy to the victims' families and friends and Transport Secretary Alistair Darling has promised a thorough investigation. Survivors have described the chaotic scene as the carriages and two engines left the track which has a 100 mph speed limit. 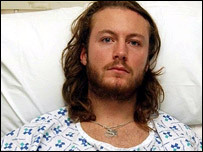 Jon Stace, 21, a graphic design student from London, suffered deep lacerations to his arm, hand and back when he was half dragged out of the carriage window as it overturned and slid along the ground. He said: "I thought I was going to die. We couldn't see anything and all I felt was my body being dragged outside the window. "I feel thankful I'm still alive - I walked away - because not only was I in danger of losing my arm but some people obviously haven't made it so I just feel lucky to have walked away alive." Jonny Saunders, who works for BBC Radio Five Live, said: "We came to a juddering halt and suddenly the lights went off, screaming, shouting and it went pitch black, then total chaos in the carriage for a few moments." More than 20 ambulances and 14 fire engines rushed to the scene - close to the A4 between Reading and Newbury - from surrounding counties as injured passengers were dragged from the wreckage. A total of 61 injured were taken to the Royal Berkshire Hospital in Reading and others to the North Hampshire Hospital in Basingstoke. A spokeswoman for the Royal Berkshire said one man with multiple injuries was in a life-threatening condition in intensive care. Four adult patients were "serious but stable" with "mostly chest, pelvic and abdominal injuries and fractures", nine had minor injuries and two of these would be discharged later on Sunday, and 47 had already been discharged. Britain's main passenger group has called for a thorough inquiry into the safety of level crossings. Rail Passengers Council national director Anthony Smith said: "There are two big questions which need answering quickly - what was the car doing on the railway line and why did the train derail in such a catastrophic fashion?" The level crossing was unmanned with half barriers on each side of the road. Earlier this year, Her Majesty's Railway Inspectorate said level crossings posed the "greatest" potential rail risk. It said existing level crossings were gradually being removed, with no new ones being built. But railway expert Christian Wolmar said it would be unrealistic to call for them all to be scrapped. "It is as if you were saying, 'Because there are a lot of accidents at traffic lights, we need to have an underpass or overpass at every traffic light.'" People worried about friends or relatives should call the Thames Valley Police casualty bureau number on 0870 010 0732.